Decentralising discovery on the Web can be the blockchain’s killer app. The popular narrative in the Bitcoin/blockchain community is that we can reinvent the way the Web is monetized by introducing micropayments for content. The main assumption is that if we can figure out the UX that’s easy enough for the regular users, people will start paying creators for the content they consume. So whenever a user visits a site they find valuable, they can decide to transfer small amounts of bitcoins to the creator of the site (or any other online content). If many users do the same, all these microtransactions add up to a significant amount and creators can make a living producing content and being rewarded directly for their work. In this model, advertising is not necessary as users will support creators directly. So if you’re a publisher you won’t have to use Google AdSense to display ads on your site. The money should come directly from the visitors tipping you with small amounts of bitcoin. Bitcoin micro-paywalls is another idea for content monetization with Bitcoin. To access the page, you have to pay small amounts of BTC otherwise you’re denied entry. Again, the idea is that if we solve the UX — users will start paying for content automatically while browsing the web. It’s too early to predict whether this vision of the future will indeed materialise. We can assume that in some niches it might work. However, the early signs are indicating that opposite is the case. The adoption of Bitcoin tipping buttons is not really growing exponentially and culture of tipping is limited to several Reddit communities. Even there, among the earliest of the early adopters, it’s not really a mainstream activity. A quick look at the Amazon Kindle Store and AppStore is also quite informative. Lots of Amazon Kindle books or iPhone apps cost less than a dollar already, they go for $0.99, and most of Kindle authors and iPhone app developers will never make any substantial money out of them. And that people have credit cards already connected to these systems. The payment experience is already seamless and convenient. And if something goes wrong there’s always a customer service person ready to answer our problems. Still 60% of apps in the iPhone app store are never downloaded. Would Bitcoin tipping or micropayments change that? What I’ll say now might sound controversial but unfortunately, this is becoming a new normal. Content and information are abundant and are becoming more abundant at an exponentially growing pace. There’s just too much stuff on the web. So the entire concept of ‘content monetization’ is becoming more obsolete. Whatever is abundant is not valuable anymore. 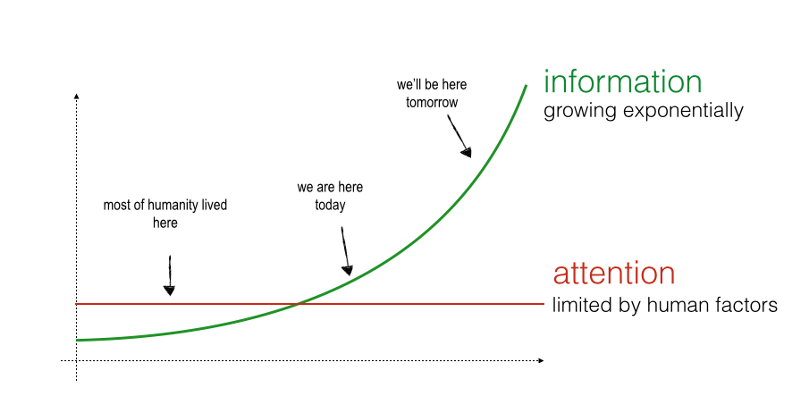 The primary scarcity of today’s world is ‘attention’. If you’re reading this article your attention cannot be invested anywhere else. The growing amount of apps, services, products, news is competing for your limited amount of attention and this competition is getting fiercer. This is the reason why ‘discovery’ is such a profitable business. Google Search or Facebook’s Newsfeed are in the discovery business. The attention of millions of users is aggregated in these services so they can extract huge amounts of value by selling access to this attention. The same is true for mobile app stores —Apple’s App Store or Google’s Play Store. While the publishers are getting outraged that Google and Facebook are making all the money while producing none of the content, what we’re seeing here is the pure economics at play. Money flows to what’s scarce and content is not scarce anymore. The same person won’t pay $1 for access to a blog article but will pay more than that for a click from AdWords to get traffic to their business. That is the reason you can’t fully replace AdSense with Bitcoin micropayments because with AdSense the value is in people’s attention (represented by ‘traffic’) and that’s what people are paying for. I pay you $1 to redirect attention (‘traffic’) from your site to my site. Because attention is scarce and getting discovered is hard. Content is only as valuable as the amount of attention it can attract. Sometimes there’s no content and lots of attention — look at the Google’s search page. Extreme centralisation of discovery leads to the situation we’re having today with few big winners taking all of the profits. So everyone working in the decentralisation space that wants to ‘fix the Web with Bitcoin or blockchain’ should focus their efforts on decentralising discovery. In other words, how can we design systems where value generated by discovery is distributed more equally among participants of the platform. For example: website owners holding a stake in Google, app developers having stake in App Stores, users having a stake in Facebook etc. Or if we get a bit more futuristic — VR creators having a stake in VR worlds, or bot creators in bot search engines. 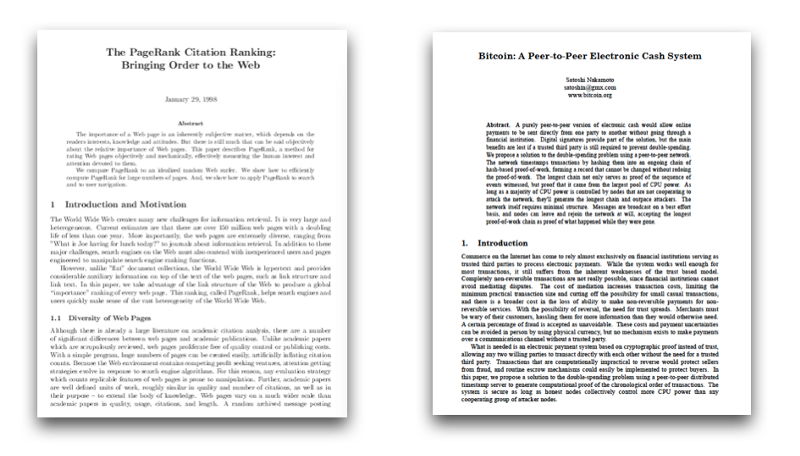 What Google PageRank and Bitcoin whitepapers have in common? I understand that for many of you similarities between these two papers together might not be immediately obvious. What does Google’s indexing algorithm have to do with the system of decentralised electronic cash? It might be easier for you to see this similarity if you’ve ever worked in the Search Engine Optimisation industry and understand the economic value of HTML hyperlinks. The basic insight of Larry Page and Sergey Brin, the creators of Google, was that you can calculate the importance of the website by understanding the graph of links that point to this website. The more links a website receives the more ‘important’ it is. This numerical value of ‘importance’ called the PageRank score can be passed between sites using links. So the link from the New York Times will be more valuable from the same link coming from your friend’s blog. The first version of Google’s Search Engine was built on this insight and even though Google’s algorithm got way more complex over time the links are still the currency of the online economy. In fact, links are so valuable in the age of Google Search that buying and selling links is a multi-billion dollar business itself. Acquiring backlinks pointing to your site translates into getting more traffic from Google. Which means getting more attention. Links are the ‘attention currency’ of the internet. If you want to buy attention (‘traffic to your website’) on the Internet you need someone to link to you. Similarly, if you want to buy coffee in the USA you need dollars. The only problem is that Google’s is the ‘Central Bank of Links’ that controls value of this ‘attention currency’. By crawling the entire web, it created an internal ledger of links on the Web. This ‘ledger of links’ represents the graph of the Web and all transactions that take place between the websites. I’m intentionally using the metaphor of a ‘transaction’ here. In Google’s PageRank system, when websites link to each other they pass their reputational score along with the link. And because this reputational score affects rankings in the Google’s results, there’s a quantifiable economic value attached to these links. Of course, Google wants to prevent link trading outside of its own AdWords platform and if you trade links you can get banned from Google’s organic search results. But this is irrelevant to my point that hyperlinks can be understood as transactions that transfer economic value. By maintaining a closed, internal ledger of how websites are linked together, Google can provide a search engine and a myriad of other services built on top of that data. Ok, but you’re still wondering how does it all relate to the Bitcoin blockchain? Let’s forget for a moment about Bitcoin’s core application — a currency. Under the hood, Bitcoin is a decentralised, immutable ledger that holds the permanent of record transactions between addresses. To be even more precise, the economic value — bitcoins, are stored in the transaction outputs, that can be ‘spent’ by a holder of a corresponding private key. Without going deep into the mechanics of Bitcoin, the core property of the Bitcoin’s blockchain (or any other blockchain for that matter) is that it contains the transaction record going all the way back to its origin. Every transaction that ever happened on the Bitcoin blockchain will be recorded there forever. This quality of immutability and persistence transaction can be problematic if you want to run a digital cash such as Bitcoin on top of it. All transactions can be tracked forever so there are potential issues with privacy and fungibility. If someone knows your Bitcoin address they can see your entire history of transactions because it’s public for everyone to see. That’s why it’s so important not to reuse the same addresses if you want to maintain privacy. So most efforts related to Bitcoin as digital money are focused on obfuscating the transaction history and making Bitcoin private and anonymous. But what about the use cases where you actually want to get discovered? Bitcoin’s transaction chain can be an open link graph for any data type. What if the Bitcoin blockchain’s transaction graph could be used as a link graph for any type of data? To use an example, if you want to link from your WordPress blog to another WordPress blog today you place a link in a HTML document that’s located on your local server. The fact that this link ever existed is recognised by a Google bot who will add it to their internal ledger when crawling the site. But imagine that instead of placing the HTML tag in your WordPress database you send a small transaction from your Bitcoin address to the address you want to link to and add some metadata with details of the transaction (OP_RETURN for those technically inclined). You create a persistent link on the public blockchain that connects these two addresses. If it’s difficult for you to visualise the value of such a link, let me give you a more tangible example. and look at the transaction history. This is the first Bitcoin address that belongs to Satoshi Nakamoto. Because it has so much visibility in the community people are sending it small amounts of bitcoins and some of them are even attaching ‘Public Notes’ to their transactions. Public Notes are blockchain.info’s internal feature (not recorded in the blockchain, only visible on the blockchain.info’s site) but nevertheless look at the last few transactions. Owners of two Bitcoin related sites are ‘linking’ to Satoshi’s address with URLs included in the Public Notes. So already people are using a popular Bitcoin address that receives a lot of visibility and traffic and creating backlinks to it. I don’t have access to blockchain.info’s traffic stats but I’m sure those services received some traffic using these ‘links’ that they’ve created. Now imagine what would have happened if Satoshi Nakamoto himself sent a few hundred satoshi transaction ‘linking back’ to one of these sites. Even though the monetary value of this transaction would be negligible in BTC/USD terms, the amount of traffic these sites received would be huge. That’s because this address has ‘reputation’ , is believed to belong to the creator of Bitcoin, is monitored by the community etc. There’s a lot of attention focused on this address. But let’s look closer into the economic mechanism at play here. A few satoshi transaction can translate to a several thousands of page views (I’m speculating here about the possible amount of traffic generated but it would definitely be a lot). So the economic value of this traffic (‘attention’) is far exceeding the monetary value represented by the number of satoshis in the transaction. The additional value of microtransactions on the Bitcoin’s blockchain lies in the persistent link that is formed between two addresses. These links are the ‘attention currency’ which depending on the context can be much more valuable that the ‘monetary’ value of the transaction. Satoshi’s 1 BTC is equal to mine 1 BTC if we want to buy coffee. But Satoshi’s 1 BTC transaction carries way more ‘attention value’ than mine (if it originates from the Genesis block). What I’m trying to emphasise here is that blockchains are mainly considered to be technologies for transferring monetary and financial value. They are the ‘ledgers’. blockchains as public, open, transparent and immutable link graphs for any types of data. These link-graphs might form a foundation for the future search engines, social networks or app stores. But this time, they would be public, open and controlled by the users or entities who contributed to the graph. Today, your likes are stored in the internal ledger of Facebook and your links — in the internal ledger of Google. Of course, technically you might think your links are stored on your self-hosted WordPress blog but they only become valuable by being included in Google’s link graph. No third-party can access these graphs to build their services on top. Or if they can, it’s only through tightly controlled APIs that protect data monopolies. The necessary components are already here. Most of these companies are focused on providing services to the financial sector… for now. But I believe there’s a bigger opportunity for them to offer services based on non-financial link graphs. I won’t go into details here, but if you work in any of these companies or similar ones — I’d love to talk to you — please reach out to me at @maciejolpinski on Twitter or via the contact form on my website. I believe that we’re heading towards the future where financial graph and the attention graph (web link graph, social graph etc) will be embedded into the same blockchain based system. 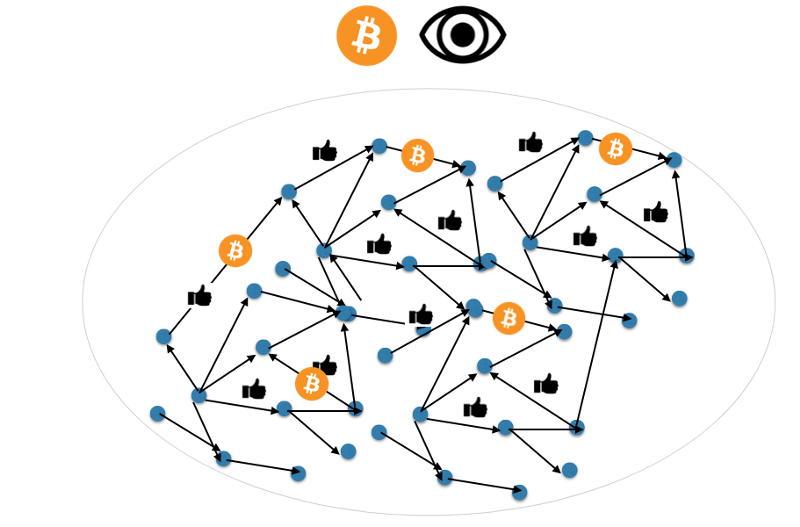 Whether that’s one Bitcoin blockchain or a mesh of multiple blockchain is yet to be seen. 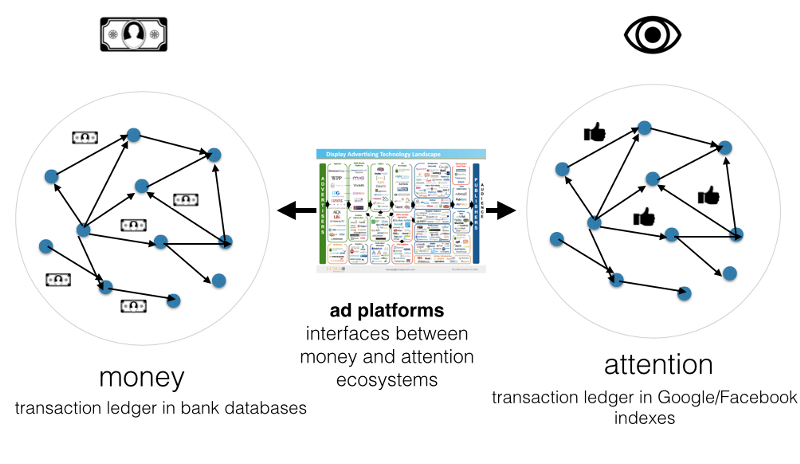 Today, the exchange of digital value looks roughly like this — financial networks and attention networks are separate systems. The entire industry of advertising platforms makes money by exchanging links/likes for dollars and vice versa. But I’m convinced we’re heading towards this future where different types of value will be exchanged on the same network. We’re still years away from this vision becoming a mainstream reality. But interestingly enough, some niche applications can be explored today with currently available technologies. I’ll be writing more about this in the next articles. I’d love to get in touch with you if you’re building any type of service similar to what I described here. The model I’ve outlined can be recreated on any type of public blockchain (Ethereum or other) and I used the Bitcoin Blockchain as an example here. WebRings And Blockchains. Can this 1990s discovery model power the decentralised web? My previous article ‘Decentralising Facebook with Blockchains and Userfeeds’ received a lot of interest from the community and many thoughtful responses in the comments. how can we rethink the existing discovery models on the internet using the blockchain? Discovery is extremely centralised today with Google and Apple running their respective app stores, Google running Search , Amazon being the key discovery platform for products, YouTube for videos etc. The key element of social platforms such as Facebook or Reddit is also discovery. We’ve already explored the disadvantages of closed data platforms and the need for the more open and participatory architectures in the previous article. So let’s look into potential applications of the ‘userfeeds’ — the decentralised discovery networks based on the idea of WebRings. Some of you might remember the pre-Google era of the Internet. There was an interesting concept that emerged at that time — the WebRing. So what is a WebRing? The value proposition of webrings was to help website owners to get more targeted traffic to their sites. For users, webrings helped to discover more websites from the niche they were interested in. In the pre-Google era, this was a great way to discover new sites from the same category and many sites grouped together to exchange traffic within the ring. Webrings required an operator called the RingMaster who was a moderator of the ring and a dedicated server to host the webring. WebRings were one of the first discovery models for sites when the web was still in its infancy and much more decentralised than it is today. In a way, WebRings were a decentralised and a bott0m-up method of curating the Web before Google’s robots entered the game. So why this still could be relevant in 2015? My hypothesis is that the webring idea combined with the blockchain+userfeeds could form a basis for decentralised discovery networks. Users would announce their actions of joining, leaving or forming the Ring on the blockchain and in userfeeds they control. Ring Owners wouldn’t have to run the infrastructure anymore (the blockchain would take care of that), they would be just a specified roles on the blockchain responsible for maintaining the Ring. There’s lots of potential for experimentation with voting and monetary exchange within and between Rings. For example: participants of the rings would vote to accept new joiners or a joining fee could be split between the existing members. It’s one of the potential applications of Userfeeds that’s really exciting and we’ll be looking into it in more detail.